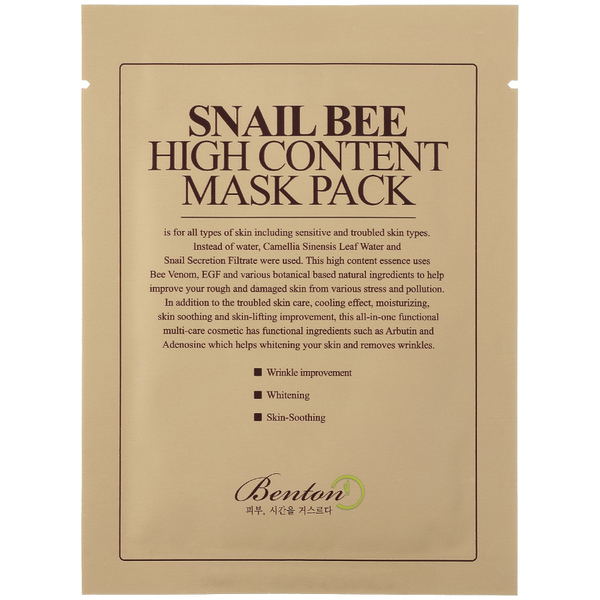 Reignite a youthful glow with the Snail Bee High Content Mask Pack from Korean brand, Benton. Crafted from pure cotton, each multi-beneficial, pre-moistened sheet mask comprises 66% Sinensis Leaf Water and 20% Snail Secretion Filtrate to help smoothen rough, dry skin damaged by pollution and environmental aggressors. Suitable for all skin types, including sensitive and troublesome, its dose of Bee Venom delivers intense moisture and hydration, whilst providing anti-ageing properties to minimise the appearance of fine lines and wrinkles. The treatment soothes and cools to leave your complexion looking clearer, brighter and more refined with renewed radiance and improved texture. Includes 10 x cotton masks. After cleansing and toning, open the packaging and place the mask gently over the face, making sure it adheres properly. After 20-30 minutes, remove the mask and pat remaining product into the skin. Store in a refrigerator for a cooling sensation.